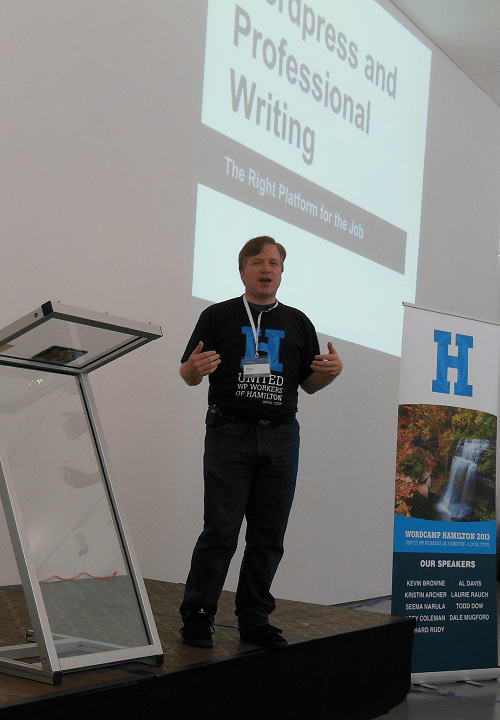 I was honoured to be asked to speak at Hamilton’s first WordCamp – a conference centred around all things WordPress. WordCamps are locally organized and span across different cities, countries, and continents. The first WordCamp was held in San Francisco in 2006 and there have been hundreds since. It’s fantastic to see Hamilton on the map and to create a WordCamp all our own. I teamed up with my friend and fellow blogger Seema Narula of This Must Be The Place for a presentation. We were one of seven presentations throughout the day. Seema and I enjoy teaming up on blog posts, so to team up for a speaking engagement in front of over a hundred people – no problemo! Ok, we were nervous. From topics ranging from community building and networks, going mobile, coding, creating themes, hosting, security, and more, it was thoroughly educational and I came away slightly overwhelmed by how much I still need to learn! Seema and I were up third, and our talk was all about getting started and blogging tips. We discussed content, social media, building your following, and getting involved with your local community. Having worked on our respective blogs for a little over two years now, we pulled examples from our experiences. It was great to co-present with Seema because we were able to bounce off each other and share our points. Although we have different approaches to our blogs, we have many common points and were able to relate to our most important one – whatever it is you’re blogging about, be passionate about it and have fun, and that will come through. After our presentation, the pressure was off and I was happy to sit back and watch the rest. The event took place at the Art Gallery of Hamilton in the Tanenbaum Pavillion. I still need to make a proper day of visiting the AGH for the blog, but during our lunch break we were able to stroll around and look at some of the exhibits, which was really nice. Seema & I before our presentation. Photo by Roz Allen. At the end of the day, all of the speakers formed a panel for the audience Q&A portion. Seema had to duck out early so I held court, although I wasn’t of much help with the coding and tech-savvy questions! It really was a honour to be up there with everyone – I felt very welcomed into the community. I also really liked connecting with people who attended – some who hadn’t heard of I Heart Hamilton before and some who had been following for a while. It was a pleasure to talk to everyone, answer some questions, and share in people’s enthusiasm for WordPress and blogging. From there, it was over to Radius to mingle at the after party over drinks and snacks. Presenting with Seema. Photo by the WordCamp Hamilton team. WordCamp Hamilton was organized by a great team – Dale Mugford, Martin Kuplens-Ewart, Roz Allen, Nick Tomkin, Geoff Campbell, Kevin Browne, Shanta Nathwani, Jacqueline Norton, Carolynn Reid, and Michael Canton. My hat’s off to the team for an extremely well run event! Some of the sponsors included Brave New Code, Double Barrel, Poly Studio, Orbital, Hamilton Economic Development, and McMaster University’s Centre for Continuing Education – check out the site for the full list. Joining the panel at the end of the day. Photo by the WordCamp Hamilton team. WordCamp Hamilton was a sold out event which just goes to show we have an amazing community of bloggers, web developers, and all sorts of professionals working in web and digital fields. There were also lots of people who were new to WordPress and eager to learn more. If I missed anyone’s summary, please send it along! I enjoy reading people’s thoughts about the conference. Thank you again to the #WCHamOnt team for having me. 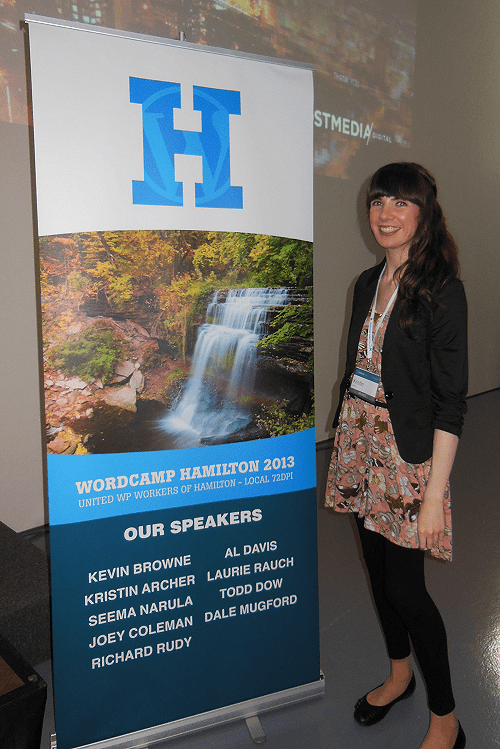 I look forward to future WordCamp Hamilton events – it will be exciting to see it grow. Thanks for the mention, Kristin. 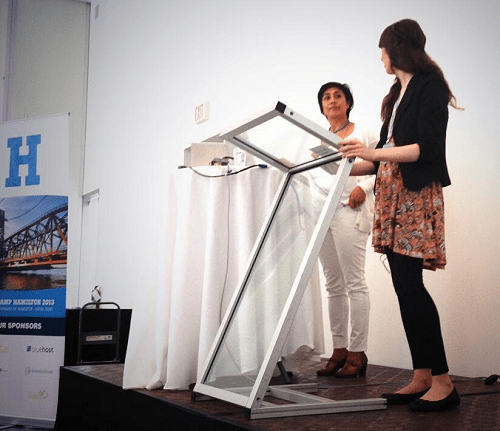 You and Seema had a great presentation that was really helpful for new bloggers. I particularly liked your example of how you’ve collaborated on some posts. It shows how blogging really is a community–which was very evident at WordCamp as well.